Get rid of Mac Cleaner virus, or Advanced Mac Cleaner, that reports numerous inexistent security issues on a Mac and demands paid registration to fix them. Different menaces on the cyber threat landscape come and go, but rogue antimalware programs seem to persevere as time goes by. Most of the high-profile online criminal crews have switched to distributing crypto ransomware years ago, but some stick with the idea that detecting fake viruses and performance issues suffices to dupe victims into paying up. 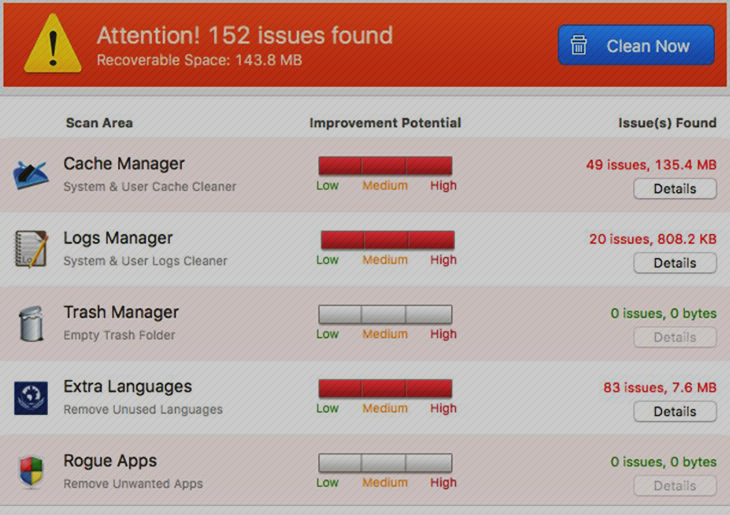 The individuals behind the Mac Cleaner application, also known as Advanced Mac Cleaner, fall under the latter category. They target Mac users with onslaughts revolving around deceitful claims that there is something terribly wrong with the compromised hosts. Well, these claims are partially true as the Mac Cleaner program itself is a malicious one. When on board a computer running macOS or previous ‘X’ editions of the operating system, Mac Cleaner starts deploying a massive brainwashing routine. It pretends to run scans that allegedly detect hundreds or even thousands of potentially unwanted items as well as problems with things like cache and system logs. The app displays a severity scale next to each category, which reflects the supposed improvement potential. In other words, it purportedly determines how much free disk space can be recovered to boost the performance of the target machine. Effectively, this baddie is a combo of fake antimalware and a counterfeit optimization utility, and that’s a toxic fusion. One of the worst things about its functioning is that it recurrently displays pseudo scan results and warning popups that are extremely annoying and diminish user experience considerably. The Mac Cleaner virus is distributed via booby-trapped app installs. The trick mostly boils down to bundling, a technique allowing threat actors to spread their bad payloads alongside legitimate products. For instance, lots of users have reported these issues start after they updated Adobe Flash via an unofficial online resource. Since the presence of a third-party applet is hardly ever clearly disclosed during these compound setups, users just keep clicking ‘Next’ or ‘I agree’ buttons and thereby unknowingly authorize the installation of a troublemaking entity. In case the Mac Cleaner malware attack is underway on a Mac, don’t fail to follow the steps below to get rid of it. 1. Download and install MacBooster application (read review). The tool provides both optimization and security features for your Mac. Before you get down to obliterating Mac Cleaner virus proper, consider checking your machine for other security risks and performance issues by hitting the Scan button. 2. Proceed to the Uninstaller feature, find Mac Cleaner / Advanced Mac Cleaner on the Applications list and have MacBooster completely eliminate all components of the app from your Mac by clicking Uninstall in the bottom part of the GUI. Doing so will ensure all components of the malware and its remainders, which may have not been removed in the manual way, will be thoroughly cleaned up.